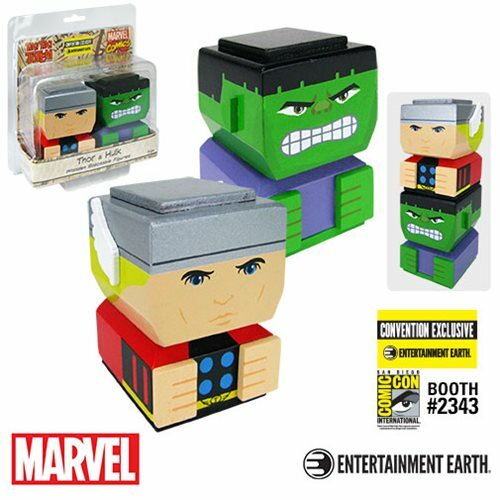 The Hulk and Thor stand together again as stackable wooden figures! Bruce Banner's "other guy" and the God of Thunder each measure about 3-inches tall. Entertainment Earth Convention Exclusive! You've never seen Hulk and Thor like this before! Welcome these Marvel superheroes to the world of stackable wooden Tiki Tki Totem pieces, and create your own custom Tiki Tiki Totem pole. Standing approximately 3-inches tall (subject to change), Bruce Banner's alter ego and the God of Thunder feature stunning 360-degree artwork so they look fantastic from every angle. The Thor and Hulk Classic Tiki Tiki Totem Set of 2 - Convention Exclusive is a limited edition that includes a holographic sticker with the production number, so the time to order yours is now! Ages 14 and up.